As experts in arts integration and linking the arts with classroom learning, InterAct Story Theatre provides professional development opportunities for teachers, artists, and child care providers. For information about professional development residencies, intensives and institutes, please click here. If you'd like to know about our 60-minute, 90-minute, 3 hour or full professional development workshops, please scroll down! InterAct Story Theatre is an approved provider of Core of Knowledge training through the Maryland Office of Child Care; if you are a Maryland provider or center interested in hosting a training, please contact us for more information about which trainings are eligible for Core of Knowledge clock hours. New training workshops are being added for the 2016-2017 school year. Please check back soon, or contact us for more information! In this workshop emphasizing character traits and motivations, mood, emotions, and interior monologue (for older students), teachers learn techniques through which they can lead students in examining text, making inferences, and then applying those inferences to create casual classroom operatic scenes. This work is especially strong for Reading/Language Arts and Social Studies, and has been implemented successfully with students from ages 4 and up. A hallmark among strong readers is the ability to visualize and develop mental images of the actions and events described in texts. The creative drama strategy of tableaux fosters visualization skills and encourages students to develop and present strong sensory images, thereby strengthening understanding of text and allowing students to gain a deeper connection to the text. This strategy can be adapted to a variety of content areas, and is especially valuable in working with informational text. This workshop is also available as part of a professional development arts coaching residency. Readers Theatre offers students opportunities to interact with text and build oral fluency. It provides repeated reading practice, which is a key factor in building fluency. Repeated reading practice also improves students’ and enthusiasm for reading and confidence in themselves as good readers. But how to implement Readers' Theatre with young readers whose skills are just developing? In this training, Ms. Oliver-Krueger leads participants through a creative drama-based process in which teachers develop and perform engaging readers' theatre scripts with their students. In this workshop, teachers discover how to create and host an imaginary talk show, "Books Alive! ", in their classrooms. Students portray characters from a book and answer questions in role. The questions encourage the students to make predictions, draw inferences and examine the theme of the text. An amazingly fun way to achieve and assess reading comprehension! Sometimes the hardest part of writing is just getting started! In this professional development workshop led by InterAct Story Theatre’s Executive & Artistic Director Ali Oliver-Krueger, participants learn by playing and creating stories on the spot, exploring strategies that spark creativity and address prewriting skills, oral composition and discourse, speaking and listening skills. We'll engage in warm-up activities for getting brains moving quickly and flexibly, and strategies for facilitating brainstorming and collaborative composition, and tips for dramatizing stories as a way to review and identify points of revision. These include concrete, easy-to-apply "bite sized strategies" that teachers can apply quickly in a few minutes, expand into full arts-integrated lessons and units, or even use to springboard students into creative projects and deeper exploration of content. The ability to look beyond what is explicitly stated in order to make inferences is one of the key characteristics of strong readers, and is consistently one of the biggest challenges faced by struggling and reluctant readers today. This powerful strategy combines active listening, movement, and music to give students valuable practice in making inferences. Participants will learn the process of a Music Detectives lesson: learning and applying basic elements of music to examine musical samples, searching for clues, reading between the lines to make inferences, and then citing specific evidence from the "text" to support their theories. By giving students a chance to practice making inferences away from written text, we help students gain skills in predicting, drawing conclusions, and hazarding educated guesses, so that they can bring those skills to written text with greater confidence. This workshop combines the strategies of Music Detectives and Creating Casual Opera, offering teachers a comprehensive approach to building reading comprehension and writing skills through drama. Teachers learn techniques to prompt inferences through active listening, acting, and simple composition. These strategies can be learned and applied by non-musicians and music enthusiasts alike! Tableaux and Living Statues are among the first creative drama strategies that many teachers learn for integrating drama with classroom curriculum. But are you and your students getting the most you can out of this powerful and endlessly adaptable strategy?Designed primarily for teachers who have had some exposure to Tableaux, Living Statues, and/or Artful Thinking routines, this workshop explores advanced adaptations and extensions such as Conflict Webs and Statues, Internal/External Conflict, The Human Video Feed, Tableaux games, and effective uses of Tableaux as Assessment. In the half-day and full day workshops, teachers also have an opportunity to discuss and workshop ongoing work with this strategy, to brainstorm with Ms. Oliver-Krueger and their peers for ways to fine-tune and freshen up existing plans. This workshop is also available as part of a professional development arts coaching residency. This workshop introduces simple creative-drama based techniques through which teachers can lead students in developing, planning and performing Readers' Theatre presentations rooted in literary text or content curricula. Readers' Theatre offers students opportunities to interact with text and build oral fluency. It provides repeated reading practice, which is a key factor in building fluency. Repeated reading practice also improves students’ and enthusiasm for reading and confidence in themselves as good readers. 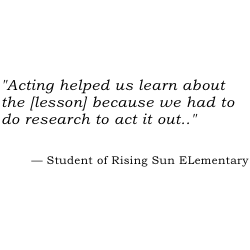 The process of developing and performing original Readers' Theatre scripts also gives students a fun, creative way to not only build their understanding of a text or topic but also demonstrate their understanding to others. Informational text can sometimes feel dry, and motivating students to dive in can seem like a daunting task. How can we inspire students to embrace informational text with the curiosity and zeal of artists? Many of the best composers, playwrights and performers dive into informational text and research to create artistic work by reading between the lines to imagine the actions, emotions, motivations and conversations. In this workshop, teachers learn techniques through which they can lead students in approaching informational texts like artists: examining sources, building knowledge, making inferences, and then applying those inferences to create casual classroom operatic scenes that breathe life into the topic through music and drama. A portion of the workshop is dedicated to brainstorming and planning practical applications for the classroom; teachers are encouraged to bring an example of informational text or curriculum planning materials they might like to explore with their students.